A Pony to School is the third in the Augusta and Christina series, and in it the two girls have equal billing. The first book, I Wanted a Pony, is the story of Augusta. She plays a minor role in Three Ponies and Shannan, but that is mostly the story of Christina. In A Pony to School, Augusta and Christina are now being educated together, because they're sharing a governess. They're approached by a local farmer, Ted Dunne, who asks them to take on his pony, Clown, who's been shoved out in a field and forgotten about. They agree. What Ted Dunne has not told them is that Clown is a rearer. When I was growing up, the advice you often heard was to break a bottle between the rearer's ears. This did presuppose that you carried a handy bottle about your person, but perhaps if you were a particularly hard type, you did, in the unhappy event that you drained your hunting flask dry. It also supposed that the rear would happen in a controlled enough fashion for you to hang on, whip the bottle out of your pocket, and wield it. And that you weren't fussy about inflicting brutality. I never saw it happen. And I (thankfully) did not have a handy bottle the only time I was reared with. The horse I was riding was generally very good, but an otherwise obliging lorry slowed to a crawl and inched past us. As he did, a branch scraped along the lorry's side, and it screeched like a banshee. This was too much for my horse, who stood up on end. I remember leaning forwards as far as I could, but the road was slippy, the horse lost his footing and over backwards he came. Fortunately I went one way and he went the other. Rearing is one of those sins that is supposed to condemn a horse. It didn't in this book, as Clown settles down, enjoys his work, and goes on to Do Good when he takes the place of poor, tetanus-struck Seaspray. Seaspray's awful fate is one of those pony book scenes that has stuck with me throughout life. Diana Pullein-Thompson didn't pull back from describing the horrors that could assail a horse, and the fate of poor Seaspray meant that whenever I drew up a list of The Costs of Owning a Horse, a tetanus vaccination was always high on the list. 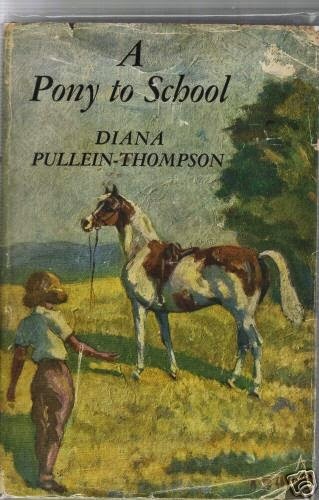 The Pullein-Thompsons were always keen on education, and Diana certainly succeeded with this one. Those responsible for the covers of A Pony to School appeared to favour the before school, rather than the after. The first edition, published by Collins in 1950, was illustrated by Anne Bullen, who chose to show a Clown who is going to take off the moment the girl trying to catch him takes another pace. The next two editions, both by Armada, chose the dramatic rearing episode. The first was published by Armada in 1963, with a cover by Peter Archer. 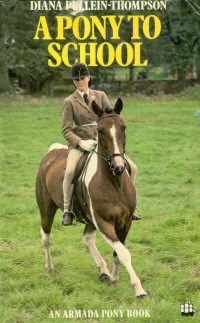 The next edition appeared in the 1970s, with another rearing pony, sadly of completely the wrong colour. And, I always think, a rider somewhat overdressed for a hack. The last printing had a photo cover, and appeared in 1978. It showed an entirely more disciplined Clown. For more on Diana Pullein Thompson, see her page on my website.